Review by Karen Topham, American Theatre Critics Association member; photos by Suzanne Plunkett. In this, the 200th anniversary of the writing of the classic novel Frankenstein, there will be no fewer than four distinct productions based on Mary Shelley’s emotional Gothic thriller. The rest of them will need to go a long way to be stronger than Lifeline Theatre’s dark, moody, gender-switched interpretation adapted by Robert Kauzlaric. In this new version, staged on a set designed by Joe Schermoly that itself seems broken and shattered and is scattered with many props that will become useful as the story goes on: things that will become the monster, Victoria is almost literally picking up the broken pieces of her life. In her grief, she sets out to use the latest of scientific studies to find a way to reanimate her father, but instead creates a being so hideous to her that she rejects it the instant it is created. The creature is played by a brilliant puppet designed by Cynthia Von Orthal and animated by the actor who played her dead father, Chris Hainsworth. From the start, Hainsworth makes it clear that this is not the benevolent man brought back to life but something new and powerful, something demanding what it will never receive: the love of its creator. The gender-switching of the main character also enhances the creation myth present in the original: it is females who give birth, and Victoria is therefore the creature’s proverbial “mother,” making her rejection far worse. Sonneville, who narrates the story using (mostly) lines from Shelley’s novel and who is, perforce, onstage for the entire show, gives a performance that is pained and painful: the depth of her character’s loss infuses its every moment, and the horror at what she has done only increases as the creature, to avenge her rejection, begins its terrible spree of murdering her loved ones. If you’ve never actually read the novel, you might not really know the depth of pain this creature is in. All it wants is “communion” with someone, but its hideous form precludes that possibility. Hainsworth’s portrayal brings the creature’s two sides—both longing and murderous—to provocative life. Its revenge is powerful and deeply emotional, as each one of its victims becomes another puppeteer, another voice, another soul entwined in this awful and awesome creature’s frame, and the more puppeteers that move and speak for the puppet, the more painful it becomes to Victoria to witness it; her sense of loss is multiplied by more than the deaths but by the spirits now haunting her in this outrageous form. Director Paul S. Holmquist draws out excellent portrayals from all of the actors tasked with bringing this harrowing tale to life: Risha Tenae as Victoria’s bereft mother, Ty Carter as her would-be husband Erich (Elizabeth in the original story), Rasika Ranganathan as her best friend Helena (Henry in Shelley’s novel), Emily Ayre as the horribly doomed Justine, and Trent Davis as Victoria’s young brother William. Each of them also portrays the demon spirits haunting Victoria as she first seeks to build the creature and then seeks to escape it. Holmquist keeps his pace powerfully quick, and the only times that the 90-minute production slows down are when the creature is assimilating a new soul. Jordan Kardasz’s dim, moody lighting and Barry Bennett’s original music and sound lend an even deeper Gothic element to the whole production, and Izumi Inaba’s costumes—black and a combination of Gothic and Goth—work with the sound and lights to maintain the mood. As I said, this is the first of four very different takes on the Frankenstein story this year. Remy Bumppo will present one from the creature’s point of view in October, Court Theatre’s November take will be a multimedia presentation blending Shelley’s life with her story, and next spring Lookinglass Theatre will present its own original interpretation. 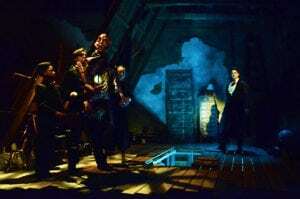 It is the year of Frankenstein in Chicago, and Lifeline Theatre’s gripping, powerful production brings it to a brilliant start. 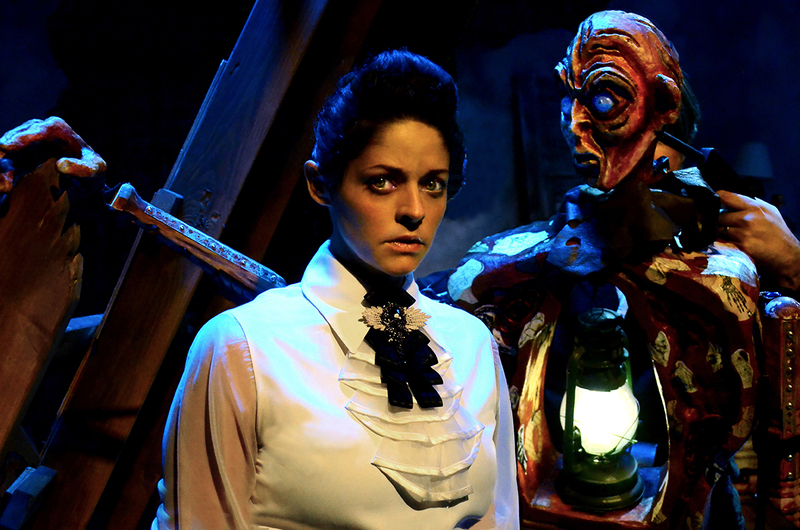 Frankenstein is now playing at the Lifeline Theatre, 6912 Glenwood Ave, Chicago, until Oct 28. Performance times vary; check the website at Lifeline Theatre for tickets, schedule and times. Find more information about current plays on our Current Shows page and at theatreinchicago.com.